Maybe it was the hurricane that relentlessly dumped water on my beautiful Bald Head Island rendering it uninhabitable for weeks. Perhaps it was the news of yet another precious young person who died too soon. Maybe it was seeing the face of my dear college friend who lost her father way too young or seeing a women’s life get torn apart as she bravely shared her story of a sexual assault only to be forced out of her home due to death threats. Regardless, a couple weeks ago something deep inside me burst open and hot searing emotion filled my whole being. Or, maybe it was the steroids. My week started out so beautifully. I am taking an online coaching class on silencing your inner critic and the daily journaling sessions have cleared my mind and allowed me to feel lighter, more free. I was happily taking Simon for a walk in the woods when I felt a hot and piercing pain in my arm. I looked down to see myself standing atop a yellow- jacket nest that was hidden underground. This sting was followed by 6 or 7 more- on my legs, arms, back and yes, my bum! It was miserable. Despite Benadryl and rest, they continued to grow and the next day I was given a package of steroids to ease the pain and swelling. They worked, but the steroids also filled me with incredible nervous energy, intense focus, clarity of thought, and intense emotion. All I could do was acknowledge it and then release it in paint. I furiously painted in my journal. Here I let out my anger towards those who take advantage of others and those who mock the pain of the wounded. I painted my rage against people of privilege who believe they are above rules of decency and morality. 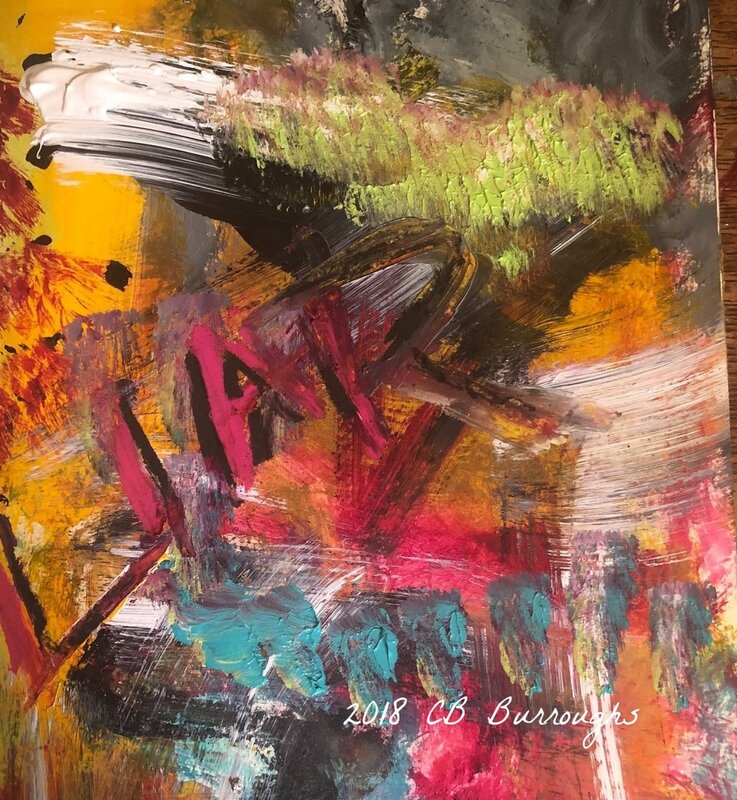 I painted for loved ones lost too soon and I painted to I silence my inner critic who tells me to dim my light; to behave and to control my “chaos.” I railed against every insecure person who has ever tried to limit the worth of the woman in their lives or who ask us to be less than who we are. When I finished, I felt release. Pure and Sweet. That release, set me on a journey of new releases. I reflected on how our lives can change in a flash. Violence shatters innocence. Overcoming it builds resilience. Precious loved ones die, children are born; friendships end and new ones form, Hearts are broken and fresh love is discovered. We lose jobs, move across the country, start new adventures. Tragedy and joy make their marks and we are forever changed. I remembered how my world shattered when my sweet sister died and the beauty that came forth once the pieces settled. For the first time I felt compelled to paint it. Again, sweet release. Then I watched the news for two days straight. I watched a terrified woman share a truth she clearly believed. She was calm and gentle. She was cooperative and accommodating. She was brave and vulnerable, careful, and steady. It was clear she was using a familiar strategy, one she has probably used many times in order to be taken seriously as a women. Be calm, don’t get too emotional, be accomodating and humble. Submit. I watched an angry man tell a truth he believed. He was not in control of his emotions. He was crass and entitled, incredulous. He wept and sniffled. He was aggressive and belligerent. He dodged questions and lashed out. It was clear that he too was using a well practiced strategy, one that has likely worked for him in the past. He used his anger to shut it down and it worked. While I do have an opinion, I can’t say for sure whose memory of that night is accurate, but I can say they were each held to different standards during their testimonies, Standards dictated by a flawed society. After the initial hearing, I was again flooded with emotion. Fierce anger plus heartbreaking sadness plus fear added up to a deep, unquenchable rage. An empowering- stand tall- look-this- in- the- eye-and- say -“hell no” rage. And something broke free in me again. I have fought hard against this double standard my entire life. Yet, I have always done so with a vague sense of shame. Society taught me to be ashamed of my female-ness. That I was less than. That by speaking up, fighting back, expressing my emotions strongly, I was somehow flawed, a bit over-the top. Perhaps, unlady like- certainly not “christian like”- a bit wild even. No more. Just like that, the shame was gone, replaced by a sense of self that I haven’t seen in a very long time. Once again, I turned to paint. Like waking from a deep sleep or escaping from a long, dark tunnel, my inner vision adjusted to a new and powerful light- blinking, startled, awed. It was bright, and messy, chaotic and confusing. But glorious, oh so glorious. I will never know for sure what led me paint these abstracts so different in style than my usual work. I suspect that journaling and the subsequent raw emotion mixed with steroid-fueled bravery gave me the courage to be even more authentic in my artwork. I’m actually grateful to those yellow-jackets for waking me up- bringing my truth to the surface. One thing is clear, from this point on, I am reclaiming my artistic journey. My paint, my pattern. My color, my chaos. My truth. I feel this is a new beginning for me. I don’t know where it will take me or how my artwork will continue to change and grow. But I do know it will be a grand adventure of honesty and authenticity, I hope you will travel along and find out with me. For more artwork, please visit my gallery. Thank you to Kelly who is helping me break free from all the things that keep me from being my biggest- baddest- bravest, most authentic self.